Race nutrition has always been something that I struggle with. Sports drinks, gels, and protein bars are expensive, taste kind of awful, and are hard on the stomach. However, I’ve slowly found ways to shave down cost and stomach both the taste and the high calories! First of all, I eat mostly Clif bars in bulk. I either get my local health food store to order me a whole box of them or I buy them at sketchy Costco. The bulk ones from Costco come in assorted flavours, but I have become quite tired of the Peanut Butter, Chocolate Almond, and Maple Oatmeal flavours. Mint Chocolate Chip is my favorite, so I get those from my health food store. They are literally the only “protein” bar that I can stomach, even though its qualities are questionable with a 20:1 calorie to protein ratio. I would try Luna bars, but they aren’t as accessible in my city. Sports drinks are tricky because one can buy cases of them at Costco and other places. However, I go with the powdered Gatorade. I don’t like all the sugar while I’m exerting myself, so I water it down a bit. Personally, I like the blue kind (I don’t know what flavour that is!). I started using Gu gels last year when I was racing. Actually, I think I used them first during my half Ironman in 2005 – remember to never do anything new during a race! Last year was the first year that I used them regularly and I remember feeling surprised at how well they worked. I think I used different gels than the Gu gels, but discovered that some of them had caffeine in them and didn’t want to have any part in that. I have heard that once you start intaking caffeine, you shouldn’t stop during a race. Not only that, but I don’t drink coffee and I’m very careful about my intake. Also, caffeine is a diuretic, which seems like a bad idea during a big race. This year, I found that Gu had some promo packs with 3 boxes of assorted gels at a discounted price. I bought the 3 boxes and have been quite pleased with the Chocolate and Vanilla flavours. The Strawberry-Banana might grow on me, but I’m not super impressed right now. 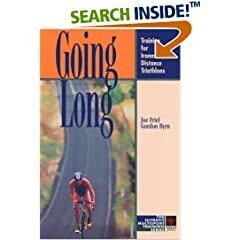 I’ve been reading Going Long by Joe Friel and Gordon Byrn (better known as Gordo by many people) and I absolutely love it. It is so inspirational and has been filling in gaps of information that I didn’t get from my coach. I have also been reading “Nutrition for Endurance Athletes” and it is great! Well, it is very dense and kind of dry – there are no pictures and very few stories, but lots of information. The information that it has in invaluable and I’ve felt so much better since reading it. Both of these books tell me that I’m not getting enough carbohydrates. In fact, I’m probably not getting enough calories either. With the amount of training I’m doing and the nutritional requirements that I have, I need to eat constantly to the point of being extremely full, which is obviously uncomfortable for actually training! In Going Long, they told me that it is common to get sick after a hard week or even a hard workout because the body is compromised. Apparently this happens to novice triathletes who aren’t used to the nutrition and recovery needed after such strain on the body. So I’m learning a lot, which is great. And here I thought that I was an expert at being a vegan triathlete after only 5 years!